Punk-Rockers ‘Shotgun Politics’ unexpectedly dropped their mini-album ‘Four on The Floor’ on New Years Eve, exclusively via Bandcamp, stating they wanted to finish 2016 on a high, and get their fans into the party spirit. With Jun Watanabe on production duties, I was intrigued to see if their energetic performances from their live shows would translate on record. ‘​​2003’ opens proceedings in classic college rock fashion – a chiming lead guitar pattern in the style of Wheatus, whilst the palm-muted rhythm chords have the tonal transistor-radio quality of ‘American Idiot’-era Green Day. However, Timmy Gunn’s vocals come over far more impassioned than the aforementioned bands, sounding more in the ilk of Augustines’ Billy McCarthy. The high octane gnarl sets a rampant tone to start the album. ‘​​Sunny’ contains more palm-muting, this time in the melodic riff, giving a slight Billy Idol edge. Whilst the descending chord progression in the verses is fairly predictable, the drums sound fat, and syncopate nicely in the pre-chorus. The harmony line in the chorus “Turn it up! Turn it up!” echoes of REM, and the heavy string bending solo at the end all pepper the mix with 80’s elements. ‘​​Cathartic’ doesn’t quite contain as much punch as the previous songs due to the over-reverberated mix, making the group vocal chants lack in clarity. It’s a shame, as the Incubus-infused guitars and Josh Klinghoffer-esque backing vocals add to what is in it’s most basic form a well-written and catchy song. There is even a nice dynamic shift for the mid-section, with guitar work marrying Fleetwood Mac and the more tender side of Kings of Leon before the drums simmer back up to emphasise the chorus one final time. The 80’s vibe continues to be prevalent in ‘​​Break’, with a distinct Blondie/New Wave feel throughout. Where the drums had sounded similar to Foo Fighters in previous tracks, the production on this feels far more post-punk orientated, and the REM backing vocals boost the emotionally charged chorus once more. Again, Shotgun Politics include a varied dynamic range, making ‘​​Break’ easily the most compelling track so far. From this point on, ‘Four on The Floor’ feels slightly messy in parts compared to previous tracks. ‘​​Chucks and Pearls’ has ever-changing drum patterns which sound slightly flat, and the outro feels distinctly underwhelming. Despite it’s promising start, with Police guitar lines and Biffy Clyro choruses, the background “Ooh”s don’t add much, and the song lacks impact. Meanwhile ‘​​Hands’ contains a bass solo by Jimmy Gunn which cries out for a bit of fuzz to match the distorted guitars. The vocal metering also comes across as slightly sticky in the opening verse. Although trivial issues, they make what is essentially a crowd-intended sing-along feel just shy of completion. And to round off, closer ‘​​Saint Denis’ does include a far grittier bass line, but sadly lacks any real depth, making the end product sound thin. However, these last two tracks do see more versatility within their group vocals. “Honey Get Up” is chanted in the vein of We Are Scientists during ‘​​Hands’, and the “Woah, woah” section in ‘​​Saint Denis’ sees higher and lower vocals added (the lower containing an unanticipated Gregorian texture with a theatrical vibrato present). 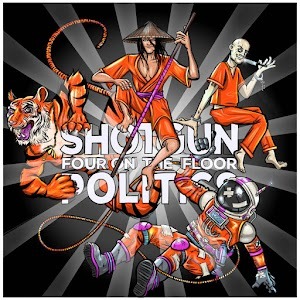 On the whole, ‘Four On The Floor’ certainly shows promise from Shotgun Politics, as well as consistent songwriting throughout. But despite the generally sound production, they are a few minor tweaks away from making this album emphatic from start to finish.